In the credits portion of the liner notes at the end, Mike Fuller is credited with mastering. However, in the lyric sheet, down at the bottom, Tom Coyne @ The Hit Factory is credited with remastering. Sounds amazing. Drums, bass and guitars are clear and punchy, vocals are up front and very clear. Quiet pressing with no surface noise at all. Recommended, if you can find one. Mine,For *Cassette,I Have Orig. 89 RoadRACER Vinyl,Too,Is one of my 47 Pre-Release ADVANCE Tapes(All with Early Pre-Mixes). 48 if count Metallica-Ride the Lightning that I taped in full off the Radio A couple months before it's release! 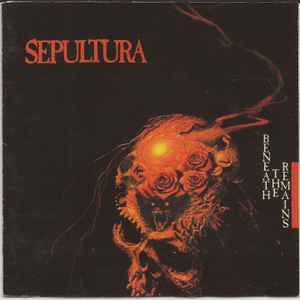 Early Mixes are Great to have & This is Sepultura's Classic Best Album(!My Opinion)! Was this version really remastered? Seems pretty quick from it's initial release. Mine's black with white swirles.. Does anyone have the same? Yes, the volume was very low. I think possibly due to the longer side b with extra tracks. Those two scratch tracks sound better than the actual production of the album. Way more natural.